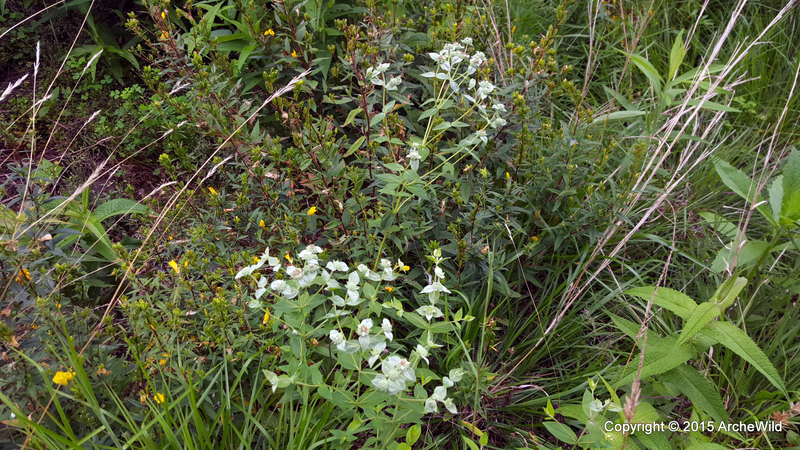 Pycnanthemum muticum (clustered mountainmint) is widely considered to be one of the top pollinator attractors on the East Coast. Its copious diminutive flowers attracts dozens of species of pollinators, has one of the longest lasting bloom periods, and attracts more individual insects than most other species. Click here to see some research results from the Penn State Extension, York County. 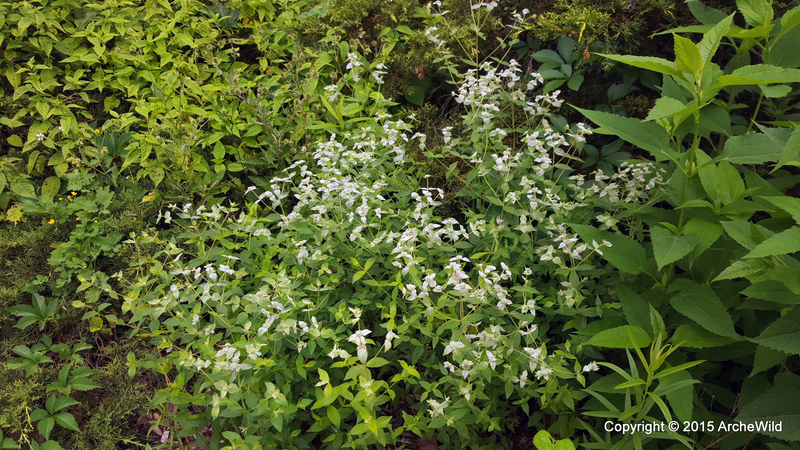 Plus, it’s short height allows it to fit into nearly any garden setting and sports a great minty fragrance. Pycnanthemum muticum flowers are pink and very small so it is usually grown for its silvery bracts because they contrast well with other green foliage around them (see picture above). Tolerant of dry and medium soils, it prefers full sun and will do well in part shade, too. An excellent meadow and garden border species. 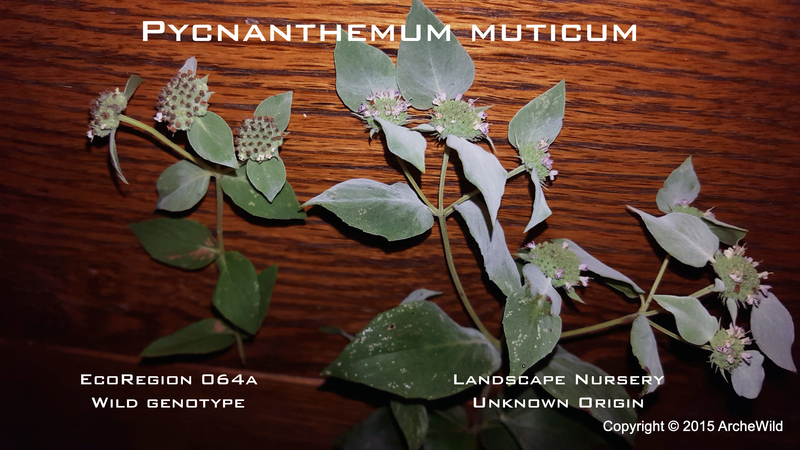 There are two types of Pycnanthemum muticum: 1) the garden-center strain, and 2) local ecotype strains. And there is an enormous difference. The garden-center, or native landscape, strain that is sold pervasively is indeed a garden thug, at least for a long while. This strain grows about double the size of most local ecotypes that we’ve seen and its leaves have 4 times the surface area. 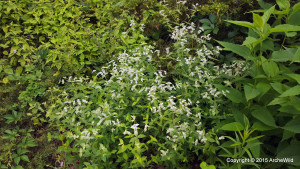 It is a very aggressive spreader in newly-prepared garden beds, which makes it useful as a weed block, but will overwhelm the lesser neighbor. In a tended garden bed, there is no holding back on this plant. Pruning, dividing, and thinning provide only temporary relief. The garden-center strain will yield, eventually, if taller species are allowed to grow around it and take some of its sun and moisture, but it always seems to persist. This strain was specifically selected (from where has been lost to history) because of its ease in vegetative propagation. Its a great plant for low-maintenance areas and attracts loads of pollinators, but planting in a natural area where it could interbreed with local populations would be unfortunate. 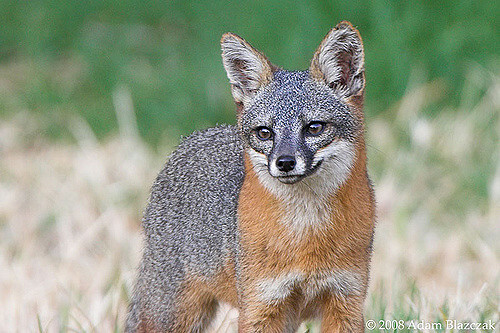 Click here to learn about EcoRegions and out-breeding depression. 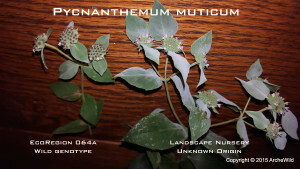 ArcheWild has located several wild stands of local ecotype, unmolested Pycnanthemum muticum from Connecticut to Maryland and they share their dissimilarity with the garden-center strain. 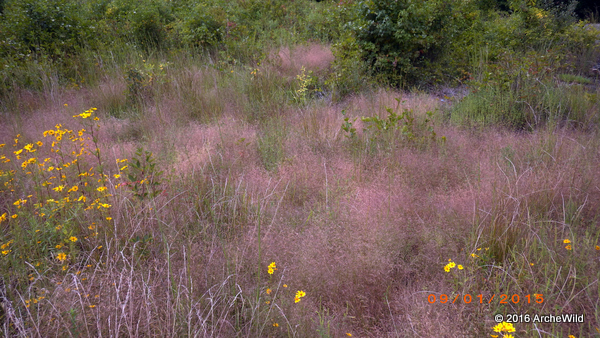 Growing singly or in sizable colonies, each plant is rather modest in size and seemingly very well-behaved. Plants grown from their seed performs in the nursery and garden environment just as it does in the wild. Modest, attractive, and non-aggressive. The picture below shows their morphological differences side-by-side. The preceding Pycnanthemum pictures are of our EcoRegion 064a local ecotype strain, which is suitable for naturalized plantings and restorations. So, seek out nurseries that offer true, local-ecotype strains of Pycnanthemum muticum and enjoy all of its benefits without having to deal with the landscape version’s over-aggressive behavior. Thanks for adding the link to the PSU Plant Trials! We will have more data to share soon. 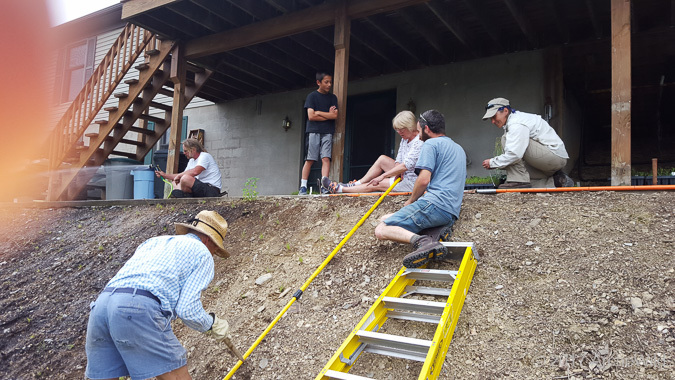 The Master Gardeners have been hard at work collecting data all summer (since the day you delivered the plants we added this season! ).